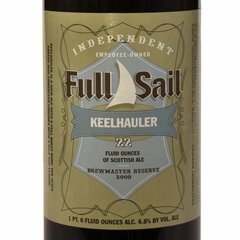 "Keelhauler is part of our rotating selection of Brewmaster Reserve Beers. Every ten weeks we come out with a different beer that show cases the brewer's art. We began the program back in 1998 as a way of celebrating our independence and creativity," added Full Sail's Founder and CEO, Irene Firmat. Keelhauler will be available in 22oz bottles and on draught in specialty beer stores and pubs throughout the Pacific Northwest from Mid-March until June. Full Sail will follow-up Keelhauler with Grandsun of Spot India Pale Ale due out in June. Full Sail will feature Keelhauler at the Spring Beer and Wine Festival scheduled for April 10 & 11th at the Oregon Convention Center. Here's the full list of Full Sail's Brewmaster Reserve 2009 line. The independent and employee-owned Full Sail Brewery is perched on a bluff in Hood River, Oregon, overlooking the most epic wind and kite surfing spot in the world. At this very moment 47 specialists in the liquid refreshment arts are crafting barley and hops into your next beer. Founded in 1987, the Full Sail crew has been fermenting godlike nectar for 21 years. Full Sail is committed to brewing great beer while adhering to socially and environmentally sustainable practices. Full Sail recently received the "Businesses for an Environmentally Sustainable Tomorrow Award (BEST)" from the City of Portland Office of Sustainable Development and the "Governor's Award for Sustainability" from the State of Oregon. Their award winning brews are now available in nineteen states. The Full Sail Tasting Room and Pub is open seven days a week. Swing by for a pint, grab a bite, tour the brewery, or just soak up the view.